Every winter, Jewish people around the world spend eight nights lighting candles, eating latkes, and spinning dreidels. But beyond the menorahs and fried food, what’s Hanukkah really about? Here are 11 festive facts about Hanukkah. 1. DON’T WORRY ABOUT SPELLING IT WRONG. The Hebrew word Hanukkah means dedication, and the holiday is colloquially called the Festival of Lights. But you’ve probably seen the word spelled a variety of ways, from Hanukkah to Hannuka to Chanukah. Because the word is transliterated from Hebrew, there’s not an exact English equivalent for the sounds made by the Hebrew characters. So technically, you could spell it khahnoocca and you wouldn't necessarily be wrong, but most people would probably be confused. 2. IT CELEBRATES A MILITARY VICTORY AND MIRACLE. During the eight nights of Hanukkah, Jews light a candle to pay tribute to a miracle that occurred back in 165 BCE. The Maccabees, an army of Jewish rebels, conquered the Syrian-Greeks, who had outlawed Jewish practices and defiled the holy Temple in Jerusalem by putting an altar of Zeus in it and sacrificing pigs. The Maccabees then rededicated and reclaimed the Temple, and although they only had enough oil to light a lamp for one day, the oil miraculously lasted for eight days. 3. IT’S NOT THE BIGGEST JEWISH HOLIDAY. The Torah makes no mention of Hanukkah, and the Jewish religion places much more importance on holidays such as Passover and Rosh Hashanah. But because Hanukkah usually occurs in December, around Christmas time and winter break when people of many religions are celebrating the season, Jews living in the United States in the early 20th century began placing more importance on the holiday. Today, Jews around the world (even in Israel) have followed suit, and Hanukkah is more important than it once was. 4. THE FOOD ISN’T THE HEALTHIEST. Traditional Christmas foods include fruitcake, gingerbread, ham, and candy canes, and Hanukkah has its own set of customary foods. To celebrate the holiday, Jews fry foods in oil to acknowledge the miracle of the oil. They may chow down on latkes (potato pancakes), sufganiyot (jelly doughnuts), kugel (noodle or potato casserole), and gelt (chocolate coins). 5. THE LETTERS ON A DREIDEL FORM AN ACRONYM. At Hanukkah, kids play with dreidels, which are small spinning tops. Tradition says that before the Maccabees revolted, Jews weren’t legally allowed to read the Torah, so they would study the holy text while pretending to gamble with spinning dreidels. Each of the four sides of a dreidel has a Hebrew character: Nun, Gimel, Hay or Shin. The four letters are said to stand for the phrase "Nes Gadol Hayah Sham"—meaning "A great miracle happened there"—which refers to the miraculous, long-lasting oil. 6. THE DATES CHANGE EACH YEAR. Because the holiday is based on the Hebrew calendar, there’s no set Gregorian date range for Hanukkah. While it always starts on the 25th day of the Hebrew month Kislev, that date can correspond to anywhere from late November to late December. This year, Hanukkah is particularly late, beginning on the evening of December 24 and going through January 1. 7. SOMETIMES HANUKKAH COINCIDES WITH THANKSGIVING. In 2013, Hanukkah overlapped with Thanksgiving, giving rise to countless Thanksgivukkah memes and jokes about cranberry-filled sufganiyot and sweet potato latkes. Sadly, the next Thanksgivukkah won’t occur until 2070, when the first night of Hanukkah will coincide with a particularly late Thanksgiving dinner. 8. SOME JEWS GIVE MONEY RATHER THAN GIFTS. Traditionally, Jews celebrated Hanukkah by giving their kids and relatives gelt (money) rather than wrapped gifts. But because holiday gift giving plays a big role for both Christians and secular people, many Jews now give and receive Hanukkah presents instead of money. To acknowledge tradition, though, most Jews give children gelt in the form of chocolate coins wrapped in gold or silver foil. 9. YOU’LL NEED TO LIGHT 44 CANDLES. 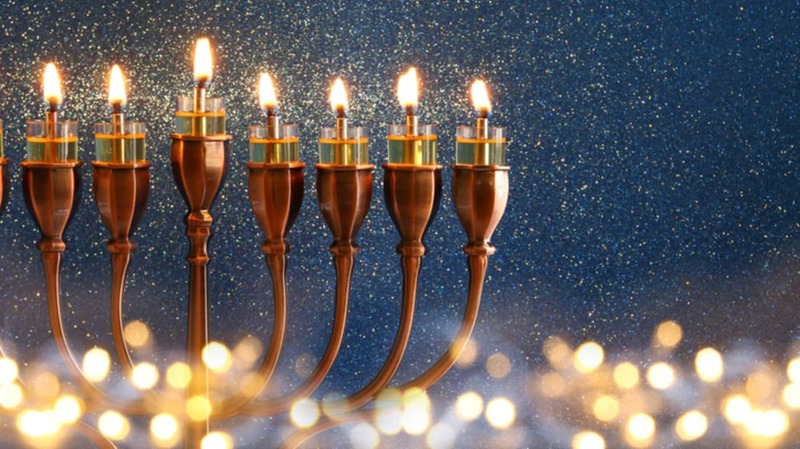 Hanukkah menorahs—which some Jews prefer to call a chanukiah, to differentiate it from the true menorah at the Temple—have nine branches, eight for each night plus a helper candle called a shamash that lights the others. Jews light the candles in the menorah from left to right, lighting a new candle, candles for the previous days, and the helper candle each night. You’ll need to use a whopping 44 candles to celebrate Hanukkah since you light two candles the first night, three the second night, four the third night, and so on. 10. YOU CAN BUY SCENTED CANDLES FOR YOUR HANUKKAH MENORAH. A big part of Hanukkah is lighting candles, but some Jews opt for a less conventional approach. Besides buying candles in different color and non-toxic varieties, there are also scented candles available for Hanukkah menorahs. If you want to make your home smell like vanilla, raspberry, or even sufganiyot, there’s a scented candle for you. 11. HANUKKAH SONGS AREN'T REALLY A THING. Christmas songs start playing on the radio long before Thanksgiving, but although you might know a few Hanukkah songs, music isn’t a huge part of the Jewish holiday. Well-known songs such as "I Have a Little Dreidel" and "Hanukkah, Oh Hanukkah" are mainly for children, and songs like Adam Sandler’s "The Chanukah Song" are mostly for laughs.